Bags are no longer necessary. Amazon has now added over a thousand Whole Foods products to its website in hopes of moving the grocer’s shoppers online. (The cost of shipping all those Echos to stores isn’t going to pay for itself, after all.) The e-commerce giant is eager for — some experts would even argue needs — its loyal customer base to buy online groceries, a business model that’s essentially frustrated everyone who’s tried it so far in the industry. One reason it isn’t catching on may be selection: An Amazon search brings up 1,945 results for “cat pillow,” so why does the site only have 214 kinds of cold cereal? 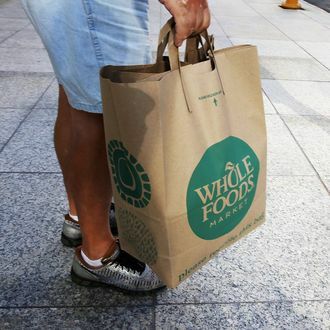 This is where Whole Foods can step in; your average store stocks 35,000 to 52,000 items, seemingly a fast, easy way to diversify the retailer’s options. Amazon says to expect more items to be added, but right now here’s a representative sample of what the site’s already got on offer. Coconut water: Who doesn’t need not-from-concentrate coconut water? Not only are 365 Everyday Value’s one-liter cartons cheaper than Vita Coco’s, but now you can Prime them to your door. Beans, beans, and more beans: A lot of grocery items are still MIA, but good news, Amazon has stocked for your pantry needs some 14 different types of 365 Everyday Value canned beans. Black beans, refried black beans, spicy black beans, cannellini beans, organic cannellini beans, organic cannellini beans with no salt added, Great Northern beans (a.k.a. slightly smaller cannellini beans) — apparently, never underestimate how easy it is to park pallets full of canned food in a warehouse. Italian gelato: Amazon went a little crazy on the Whole Foods frozen desserts, too, but the small-batch imported ice cream especially. Flavors are $6 per tub, and among the flavors are pistachio, caramel and sea salt, hazelnut, and dark chocolate. Since it’s frozen, it has to be shipped using AmazonFresh, which is an extra $15 a month on top of Prime. Spices: Easy to store, easy to ship, and have a long shelf life. Why would Amazon not offer several hundred of them? Wood-fired frozen pizza: Also just six bucks, these are an obvious easy-dinner winner, in varieties like marinated veggie and stracchino and arugula. Salmon fillets: 12 ounces of frozen wild-caught sockeye salmon go for $11, and are some of the few proteins available that you could use for an entrée. Butter: Organic 365 Everyday Value butter was one of the items Whole Foods slashed the price of on Monday (to $4.49), but if you want a pound of the conventional stuff, it’s just $3.49 on Amazon. Huge jugs of oil: For people who use Amazon primarily as a courier service for excessively heavy household necessities, they’ll be excited to learn that Whole Foods’ canola oil made the cut. A three-liter carton is just $9. Gift cards: Or maybe your go-to Whole Foods item isn’t online yet? Amazon’s got you covered. Simply purchase a gift card in a $25, $50, $100, or $200 denomination, wait for it to arrive by mail, then go spend that money in person at your local Whole Foods.